Escape Series#3: The Phone Booth is the third installment in the Room Escape game series created by Shawn Tanner aka Afro Ninja. If you enjoyed Escape#1: The Car and Escape#2: The Closet, you will love this one! 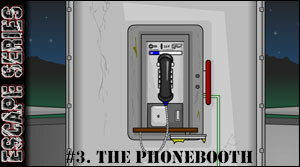 Update: Escape the Phone Booth video walkthrough! But they are all very good escape games. where the pound i can’t find it? Posted on Saturday, October 6th, 2007. Follow any responses through the RSS 2.0 feed.